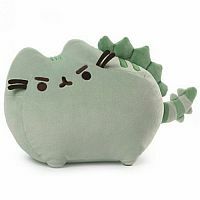 Pusheen brings brightness and chuckles to millions of followers in her rapidly growing online fan base. This 13 inch Pusheenosaurus version of Pusheen brings an adorable twist to her image in a green pastel color with dino ridges and tail. Surface-washable construction for easy cleaning. Measures approximately: 13.00 x 8.00 x 4.50 inches..